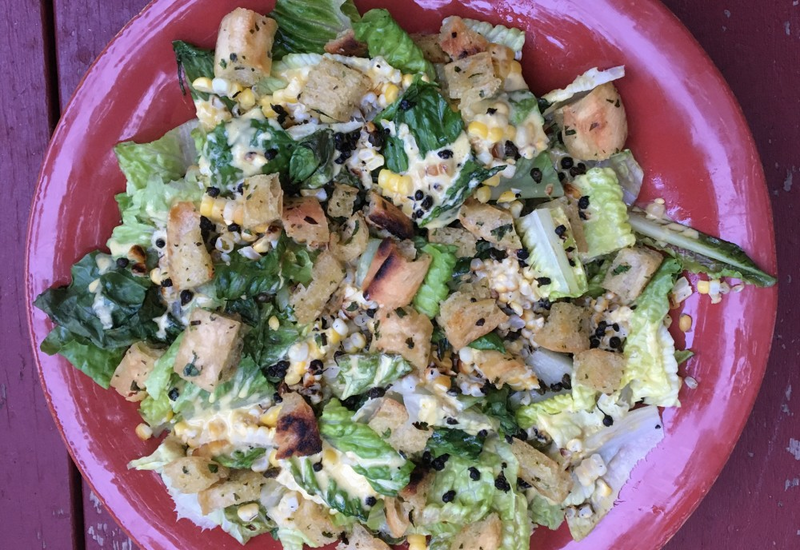 The embellishments added to the classic caesar salad here makes it explode with the flavor bomb of grilled corn and crispy olive oil fried capers. The final grilled twist is actually grilling the lettuce for that charred flavor that it will literally make your mouth sing! Add this to the menu for your next outdoor event and your guests will be blown away. Who knew a salad could be just as interesting (or more so!) than a steak or a burger? Everyone will be asking for seconds! This popular North American dish was originally created in Tijuana, Mexico by Caesar Cardini in 1924. You can easily accommodate a gluten free diet by using gluten free bread (of your choice) to make the croutons. Also, we recommend using the highest quality eggs to yield the healthiest and most delicious dressing (yes, raw egg yolks are an essential part). Per Serving: 492 calories; 41g fat; 23.2g carbohydrates; 11g protein; 81mg cholesterol; 868mg sodium. The dressing recipe for this salad is really delicious, I love that it's homemade. I didn't use grilled corn, but still loved the way this turned out. Even without the anchovies, this was really delicious and very authentic tasting to traditional Caesar salads. I really enjoyed this salad, so many flavors in one light salad. I also added some grilled chicken breast for added protein. The homemade dressing was also surprisingly easy to make and delicious.